Our Abroad101 Student of the Week honor goes to rising high school junior Marina Foster from Texas. 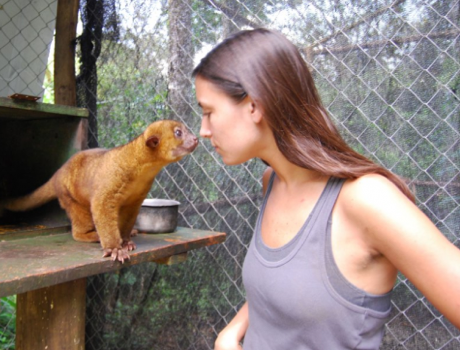 At the end of July, Marina will be traveling to Costa Rica to volunteer at Proyecto Asis, an animal rescue center, in the county of San Carlos. For two weeks, Marina will live with a host family and volunteer eight hours a day at the rescue center cleaning and building cages, feeding animals, and taking part in animal surgery, all the while strengthening her Spanish speaking skills. Marina plans to attend college and pursue a career in design and lead an adventerous life of travel. You can learn more about Marina’s Mission here. The Abroad101 Student of the Week initiative awards a student who created a Mission for a study abroad program on GoEnnounce with a to their fundraiser. Learn more about this partnership from Abroad101 CEO Mark Shay and GoEnnounce co-founder Melissa Davis here. We’re making weekly donations to #studyabroad fundraisers! We hope you can help us assist these students in reaching their goals to make their travel dreams a reality. Visit here to help with this mission. Stay tuned for our next Abroad101 Student of the Week!